Items 113- out of displayed. Below I will walk you through my analysis on German DAX. Actually I will show you my approach to the markets; how I analyze markets and predict next possible leg in combination with trendlines. Have a good day, Grega! We have seen a nice move up on oil last week, up more than 15% which was the biggest weekly gain since the 2011 following the OPEC deal to cut crude output. 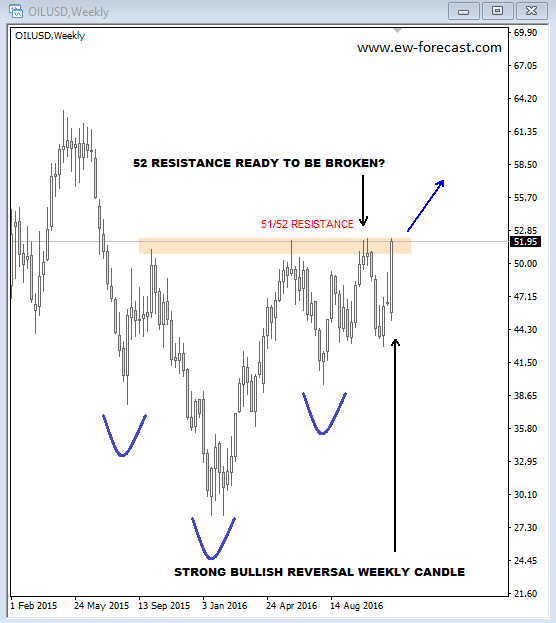 It was a nice move up, now towards $52 per barrel, which looks like an important technical level based on past price moves, but current move has momentum so resistance can be broken which may lift price to much higher levels, ideally towards $60 in weeks ahead. So if you trade oil directly through futures or cfd’s then you may want to keep an eye for short-term buying opportunities on pullbacks. But if you are more of an FX trader, then you will want look for CAD or NOK. 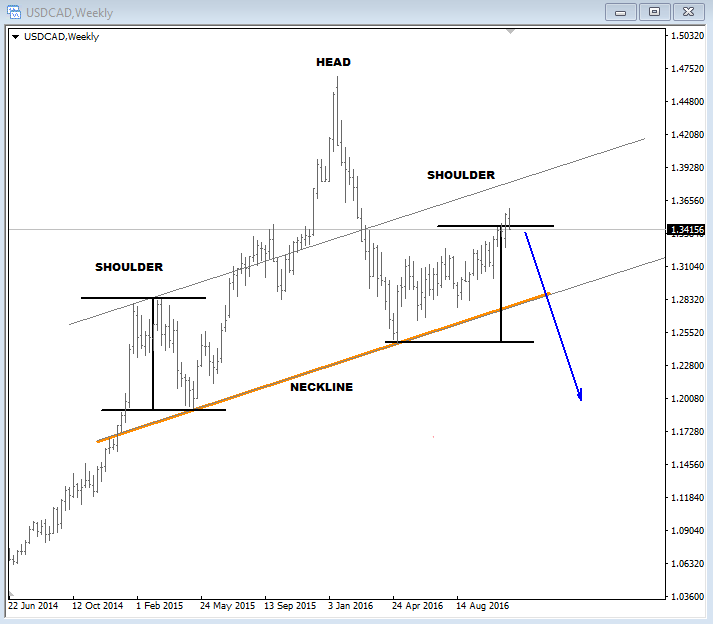 Personally I have my eyes on the USDCAD for possible shorts on intraday pullbacks next week, as big recovery from 2016 lows can come to an end. It’s a clear three wave move that signals for a strong bearish reaction in the future. Well, some CAD crosses can be even more interesting if we consider that USD index still hold strong gains in an uptrend. 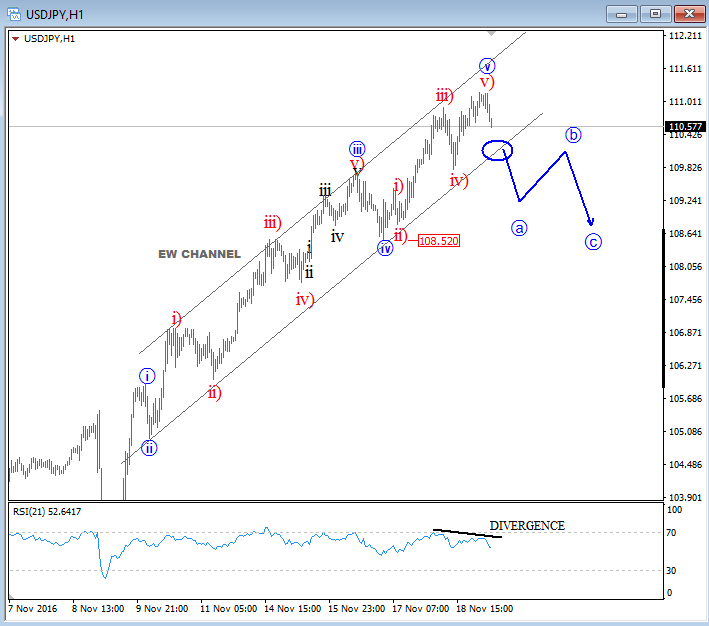 On the 1h chart of USDJPY we are observing a higher degree impulse taking place, that can be near completion at the start of this week, as all five needed waves can be counted from Nov 08 low. If that is the case, then we should be aware of a minimum three wave a-b-c set-back, ideally back to a support seen around the area of a former wave iv, at 108.52. Break beneath the lower channel line can put more bearish pressure in motion. Divergence also suggests that upside can be limited in the very near-term. But don't get us wrong; generally speaking we are bullish USD, but observing few pairs and waiting on retracements to join the trend. For our taste current price of USDJPY is just too high to get long here. 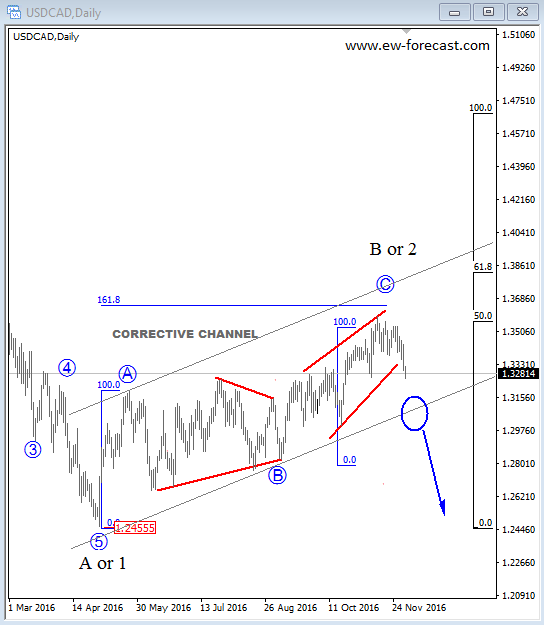 USDCAD has reached important level at 1.3500-1.3600 from where we may see a strong drop, especially if we consider a three wave rise from May 2016 low and an ending diagonal in wave "c" position of that same recovery (EW chart is available only to members). So you also see some important evidences of a turn? This week I received an email from a client yesterday, asking me if I can post analysis on VIX (CBOE MARKET VOLATILITY). It's an important market that gives you an idea how much fear is involved during volatile markets, especially when stocks are trading down like for the last few few weeks. Well, what is interesting to me is that this stock market is selling off sharply ahead of an important US elections, but event like this can be a trend changer. In other words, they can cause some reversals since I believe that flows will change. Simply put, investors will adjust their positons which may have an impact on price moves. So if trend will change on stocks, then this will be from bearish to bullish mode. Those who follows me closely will know that I am tracking final stages of a corrective retracement on S&P500 from August highs. It’s a three-wave decline at the moment, so technically I would be expecting a bounce towards the end of the year. And if I look on daily chart of VIX (CBOE MARKET VOLATILITY), then we can also say that price is in final stages of a current corrective structure, thus it also suggests a turn down, ideally from around 22-25 area. Pattern on VIX tells me that next important leg will be lower which is obviously matching with our count on stocks. Also, lets also not forget to mention an important trendline resistance on VIX, connected from 2016 highs. Two weeks back German DAX turned up strongly from 10173, clearly with an impulsive price action so we see it as wave 1 that is part of a bigger bullish cycle. As such we think that strong uptrend will continue soon, as we see current retracement down slow and overlapping; probably wave two within uptrend that can look for a base at 38.2-61.8% Fib. level. 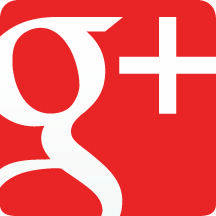 For more detail please check our video below. 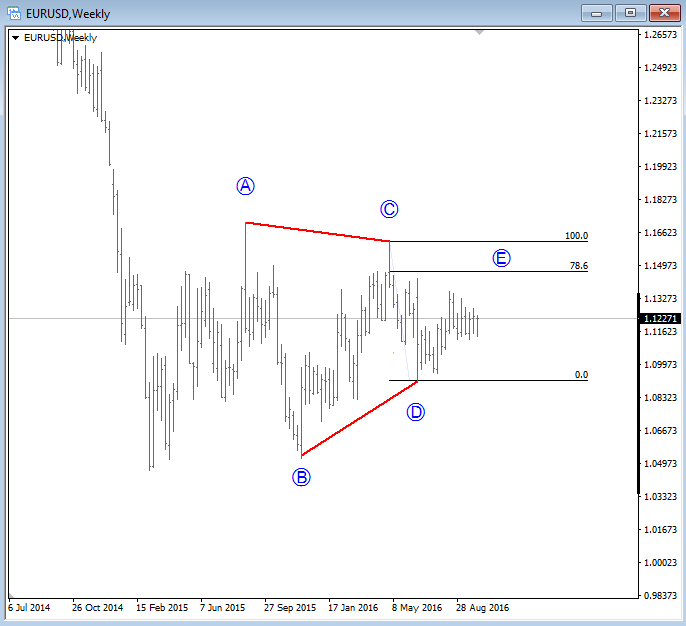 EURUSD remains slow in contracting sideways price action which we see it as a triangle. 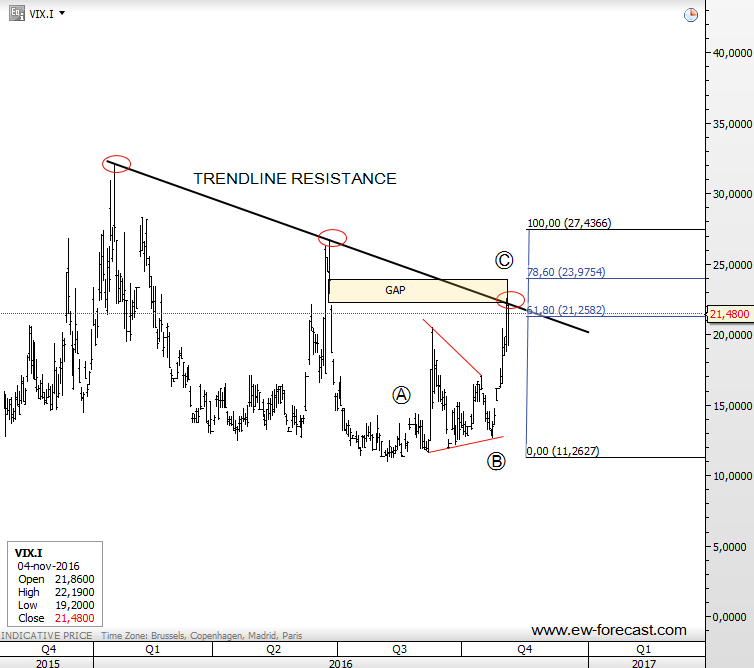 Based on subwaves and time, we think breakout of a range may occur by the end of the year. Ideally it will be to the downside but would need to see broken wave D swing low to open door for much lower levels. Before market turns south, price may see 78.6% at 1.1400-1.1500.